Times 14 September – 2 October 2010 at 7.00pm, Sundays at 2.30pm. 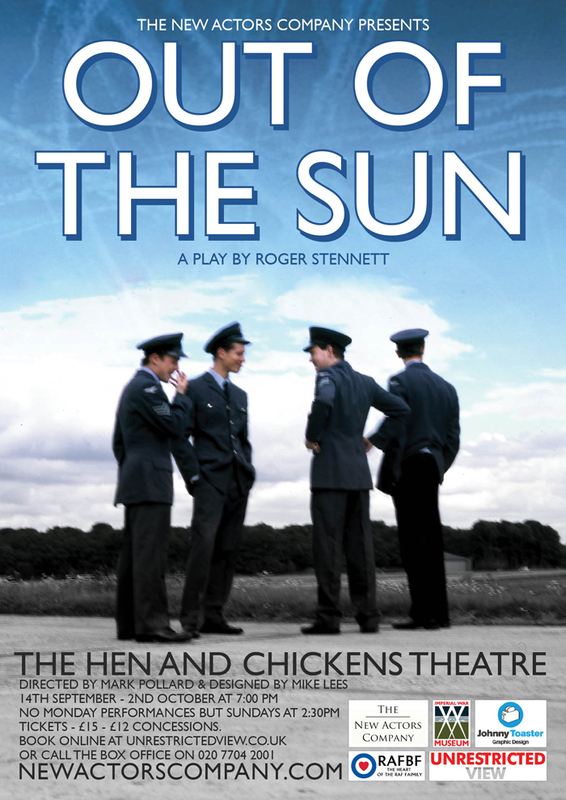 The London-based Hen and Chickens theatre is about to launch a new play to commemorate of the Battle of Britain, entitled “Out of the Sun”. In a nutshell, the play is about its pilots – the famous “Few”. The author of a screenplay is Roger Stennett, an acknowledged playwright & screenwriter whose previous work had been produced by companies such as BBC, ITV, The Royal Shakespeare Co and The Bristol Old Vic. The elegantly delivered scene presentation has been director Mark Pollard and designer Mike Lees had. “The long, hot summer of 1940. On an airfield somewhere in southern England four young Spitfire pilots sit on the parched grass outside their Dispersal Hut waiting for the ring of the field telephone that will ‘scramble’ them into the skies – and combat. ‘Desperate Dan’ Anderson, Edward ‘Weaver’ Whyte, Jonathan ‘Joker’ James – all of them ‘veterans’ by the age of 21 – and Pilot Officer Young, a fresh-faced ‘sprog’, new on Squadron that morning. How will they fare between dawn and dusk? How will they fill the quiet moments between the battles up in thin air? Hen and Chickens is a nice intimate theatre, located in Islington above a Victorian corner pub. It is perhaps best known for its solo shows, especially from big-name comics. If you are in London, “Out of the Sun” provides an opportunity for an interesting evening out, and to celebrate the 70th anniversary of the Battle of Britain in with a touch of class.